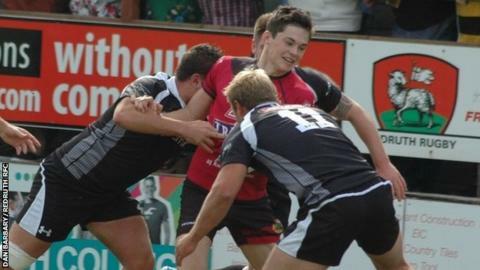 Launceston boss Neil Bayliss says he would have left his side's 20-19 defeat at Lydney early if he was a spectator. The Cornish All Blacks lost their sixth match of the season, three of which have been by a single point. "But I've got to pick some positives out of it and we showed some good character to come back at half-time." Launceston trailed 20-9 at the break before 18-year-old full-back Billy Searle scored on his debut and Kyle Speare's try set up a nervous finish. "They're not a very good Lydney side if I'm honest," Bayliss added. "If we'd have played half the rugby we're capable of, we'd have put 20 points on them by half-time, but we can't keep losing these games so tightly. "But it will happen one week and we will blow someone away."